While Iraqi officials celebrated the repatriation of what they called invaluable relics — “the return of Iraq’s heritage to our house,” as the state minister of tourism and antiquities, Qahtan al-Jibouri, put it — the fate of those previously returned raised questions about the country’s readiness to preserve and protect its own treasures. Appearing at a ceremony displaying the artifacts at the Ministry of Foreign Affairs, Iraq’s ambassador to the United States, Samir Sumaidaie, pointedly said a previous shipment of antiquities had been returned to Iraq last year aboard an American military aircraft authorized by Gen. David H. Petraeus, only to end up missing. “They went to the prime minister’s office, and that was the last time they were seen,” said Mr. Sumaidaie, who has worked fervently with American law enforcement officials in recent years to track down loot that had found its way into the United States. It was not immediately clear what happened, and Mr. Sumaidaie said he had tried and failed to find out. He did not directly accuse Mr. Maliki’s government of malfeasance, but he expressed frustration that the efforts to repatriate works of art and antiquities had resulted in such confusion and mystery. Ali al-Mousawi, a government spokesman, demanded that the American government account for the artifacts since an American military aircraft delivered them. “We didn’t receive anything,” he said in a telephone interview. Mr. Jibouri, one of Mr. Maliki’s advisers, said that if the relics were not somewhere in the prime minister’s custody, then they would probably be with the Ministry of Culture, which oversees the country’s museums. Its spokesman declined to comment. Amira Edan, the director of the National Museum, said none of the objects had been returned to her collection, which is where, she said, they all belonged. The U.S. State Department has gone above and beyond its role and responsibility when it comes to helping countries recover their stolen and looted works of art and antiquity. In addition, the U.S. State Department does a lot more in terms of assisting foreign governments than the common U.S. citizen would know. It's easy to criticize from afar. If one could do better I sugggest they volunteer their time and effort. Re-constructing countries is no easy task. I agree that State has helped countries recover stolen and looted works of art -- once they have gotten out of the country of origin -- primarily by doing a very good job managing the process set down in the Cultural Property Implementation Act. And as I have pointed out, State has also helped the Iraqi National Museum recover and done other good things with the $17 million ponied up by Bush in 2008. My point, though, is that in the case of Iraq, where cultural heritage is concerned, the State Department (not to mention the Pentagon) has failed to recognize that reconstructing Iraq's cultural heritage sector required rebuilding Iraq's capacity to police its archaeological sites. As for the excuse that reconstructing countries is no easy task, who would argue with that as a general claim? 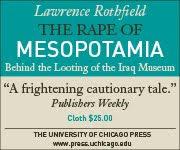 But in the particular case of rebuilding Iraq's capacity to police its sites, I do believe it was and is doable -- just as securing the museum during the invasion was doable --, if there were the will in Washington to do it. (For specifics on how, you might take a look at Antiquities Under Siege: Cultural Heritage Protection after the Iraq War.) Unfortunately, there never has been the will -- not when Donny George tried to build up his police, and not now, when the new commander of the antiquities police is starved of resources. Let me be clear: I am not saying I could do better than I do not mean to criticize those brave folks serving on the ground in Iraq. They are doing hard and dangerous work. The State Department officials I mean to criticize are the policymakers who set from afar the agendas those folks follow. My training in cultural policy analysis gives me the skills I need to make this criticism informed and constructive, and my sense of duty as a citizen has led me to devote a massive amount of my time and effort over the past three years to trying to help us get the agenda right.